When breaking new trail in the back country, snowshoes will get the job done, but Hok skis will make the job fun and fluid. These innovative skis from the Altai Company are a ski/snowshoe hybrid. With a wide base, permanent skins, and enough length to achieve glide, these skis are the best way to flow across our frozen lakes, rivers and streams. Since breaking trail in the back country is slow and tedious, don’t plan on changing locations every night like you may be accustomed to doing in the summer time. Pick a scenic yet sensible base camp site and launch day trips to explore the surrounding area. Sounds Obvious, Right? But it can be easier said than done. First and foremost, plan to “hot-tent camp”. 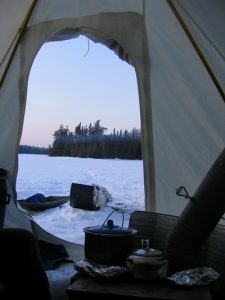 Being able to generate heat with a wood stove in a canvas wall tent is worth the extra weight. With that in mind, consider that foot travel in the winter leads to heat and perspiration while pulling a sled or breaking trail. 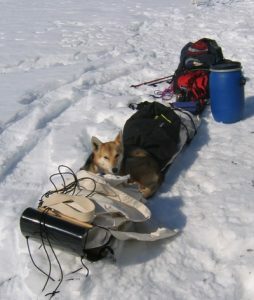 When stopping to set up camp, that heat will dissipate quickly. Be prepared to set up your tent as quickly as possible to get out of the wind before the rapid cooling catches up to you. Start your stove immediately and change into your fresh set of clothes while the sweaty pair dries on a line hung in the hot tent. Start your fire as fast and efficiently as possible. Bring plenty of fire starters. A portable propane torch will have your fire blazing in seconds, but only if your fuel source is not completely wet and frozen. As you gather wood try to find material that is dead but above the snowline. Traveling in Burn areas makes this easy. Stack the wood around the already-hot wood stove so it can be completely warm and dry before it even goes in the stove. Whenever possible, travel with someone who has more experience and is willing to share what they have learned. If that isn’t an option, research and ask other people what works for them. Our skills came from experience and that experience is invaluable. Take advantage of a mentor whenever the opportunity arises. Sign up for more tips. Learn how to set up a Snowtrekker hot tent and stove.